Concierge Medicine is an increasingly popular approach to individual and family health care that removes insurance-dictated constraints and allows for greater control and flexibility in health care decisions and treatments. 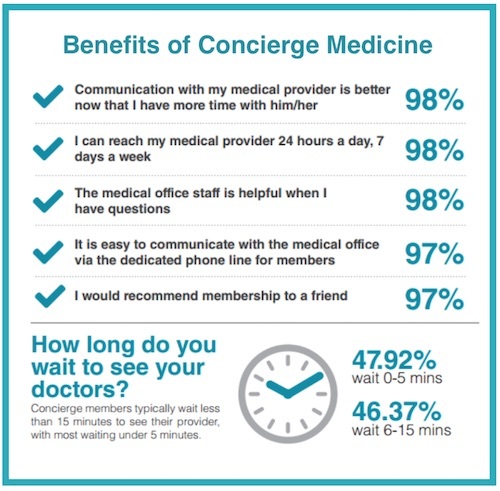 Patients who participate in concierge medical practices enjoy improved access to their preferred doctors and health care providers and greater control over health care treatments and decisions. Work overtime to keep up with insurance-dictated demands. Even the most dedicated and committed physician cannot overcome the obstacles to providing caring, compassionate and high-quality health care while operating within today’s insurance-centered health care system. Total wellness is achievable only after you embrace the idea that you are personally and solely responsible for your own health and wellness. Experience and research have proved, time and time again, that the current insurance-centered care practiced by most physicians is only able to manage disease and treat acute symptoms. Still, many people cling to the notion that their employers and insurers should foot the bill for subsidized healthcare and subpar service. Instead of settling for the status quo of treating sickness only after it has set in, why not do everything you can to stay healthier in the first place? Cultivating and maintaining excellent health allows you a better quality of life today and can add precious years to your life down the road. In addition to giving you extra time with your loved ones, a healthy body and mind will also increase your productivity and earning potential through the years. Concierge Medicine used to be an elite service that was only accessible to the wealthy, but this is no longer the case. Modern concierge practice models make it affordable for you to choose higher quality medical care. Research showing potential savings from membership in a concierge medicine practice was published in the peer-reviewed American Journal of Managed Care. The results showed that the concierge approach to primary care saved an annual average of $2,551 per patient due to decreased hospitalizations, and resulted in a 72-79% reduction in hospital readmissions for serious illnesses. In today’s medical system, your care is often fragmented between various specialists and medical facilities. As your concierge medicine physicians, we are your partners in achieving and maintaining lifelong wellness. We want to make sure that every aspect of your healthcare experience is harmonized and maximized. Concierge Medicine at Loudoun Holistic Health Partners can provide you with incomparable care and cutting-edge resources to help you get well and stay well.